Colorful and playful are the best two words to describe this game. There is whimsical music that keeps the winning inviting. I love playing free online slots that are more than winning. They need to have terrific graphics to keep me entertained. This one has rich colors with solid animation. As far as the winning goes, there are free spins galore with three, four, or five free spin icons. It is the face of a man made out of wood wearing glasses. 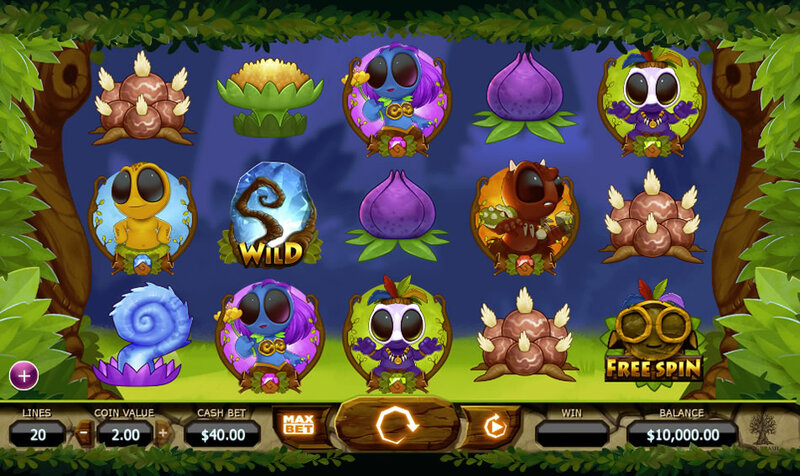 There are expanding free spins and wilds that cover the entire reel while adding payouts up quickly. The wild symbol is a tree branch with a cool blue background. The setting is in a forest with leafy trees and tribal feathers and animal bones strewn around. The other icons are four cute male or female tribal members who wear jewelry and clothing. Each is a different color, which enhances to gaming experience. In addition, four native plants make-up the rest of the payout symbols. Five reels and 20 pay lines has never been so much fun. 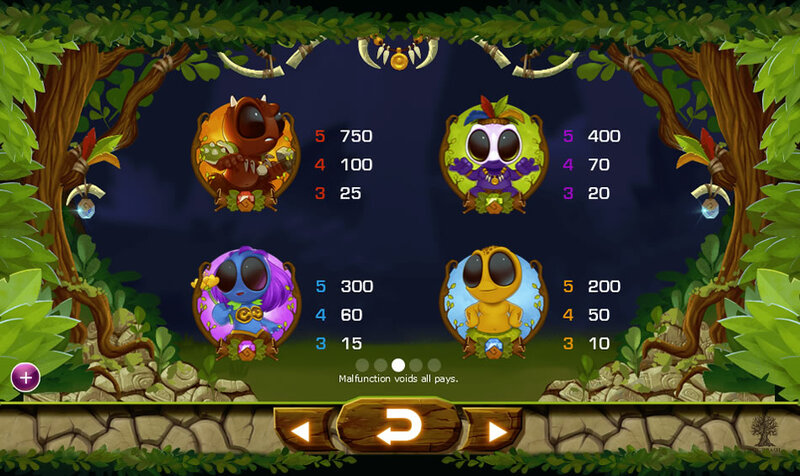 The theme of this game is to help the jungle tribe members win big money. 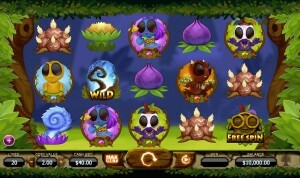 This takes place during the game and free spins round. 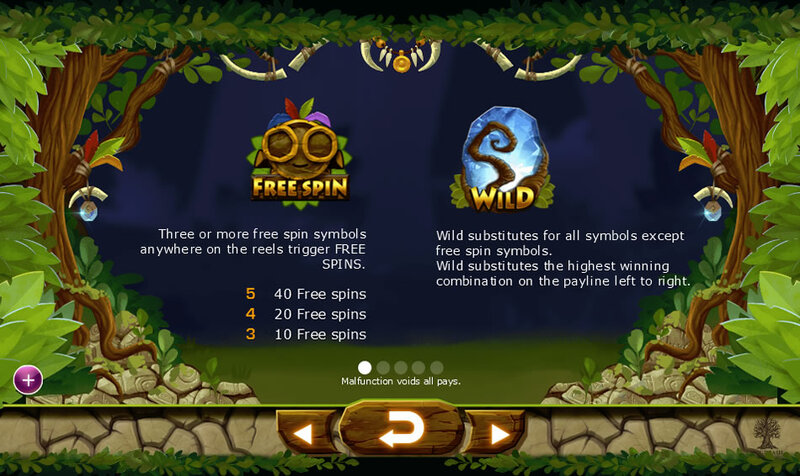 When the free spins round is activated, all the members are standing around the wild symbol. I like how the animation kicks into fast gear with light blue smoke emanating from the symbol. It floats around each icon before settling on one. This will become the expanding symbol during the free spin round. Once the winning icon expands, the character will dance or move according to their talent. I won ten free spins after five minutes of play. During the bonus round, I won the mega super big win for over 1,100 coins. The game developer is Yggdrasil. They have done a phenomenal job with the presentation. Each spin has the reels quickly flowing to a quiet stop. Animation is timed perfectly and fits the jungle theme. I have played my share of Vegas slots, but this one is more of a story with a plot that has free spins, expanding wilds, and plenty of bonus rounds. It does not take long for the wild symbol to land randomly on the reels next to an icon before the expanding begins. The same blue smoke or electricity streak zips across the screen when there is a winning spin. 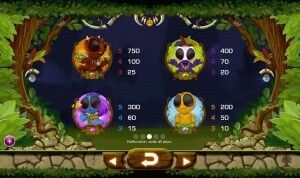 Payouts are displayed in the center of the screen in gold numbers before being added to the balance at the bottom of the reels. There is an auto spin from 10 to 1,000. I changed the number of lines, coin value, and bet amount by simply clicking the (-) and (+) symbols next to them. There is a win box that highlights with each payout. This is a winner that will be added to my list of must-play games. The animation and music keep me entertained with an upbeat atmosphere. It was easy for me to get lost with the amount of time I played, because I was so focused on seeing what the next expanding wild would do. The amount I won was secondary, although it was a winning spin almost every time. SlotsClub.com is a great site to find and play this awesome game. It can be played for real money or for fun. My favorite character is the blue lady with purple hair. She does a Hawaiian style dance when she expands. The detail of the animation has her blue hair flowing with the motion. Winning the super mega big win was exciting, because it comes out of the blue. I knew I had won, but the number kept growing as the payout was tallied.